Travel Bloggers Rhonda & Jeff Albom recently cruised the waters of South America and took a John Miles Shirt along for the ride. From the first moment I stepped onboard the Azamara Pursuit, I was home. A boutique cruise, the ship’s understated elegance is unmistakably welcoming, as is the crew. 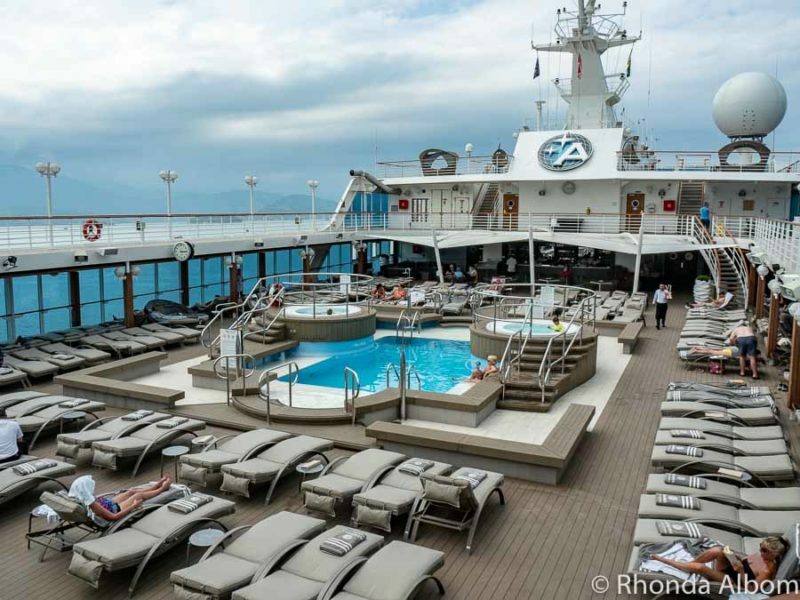 The Azamara Pursuit caters to fewer than 700 passengers, yet our worry that there might not be enough to do on this smaller ship melted away as we absorbed ourselves into daily life. Best of all, Azamara’s desire to provide immersive shore experiences translates to longer port times than any cruise we had taken in the past. The newest of three ships in the Azamara fleet, we sailed during the inaugural season of the Azamara Pursuit over Christmas and New Year’s Eve. 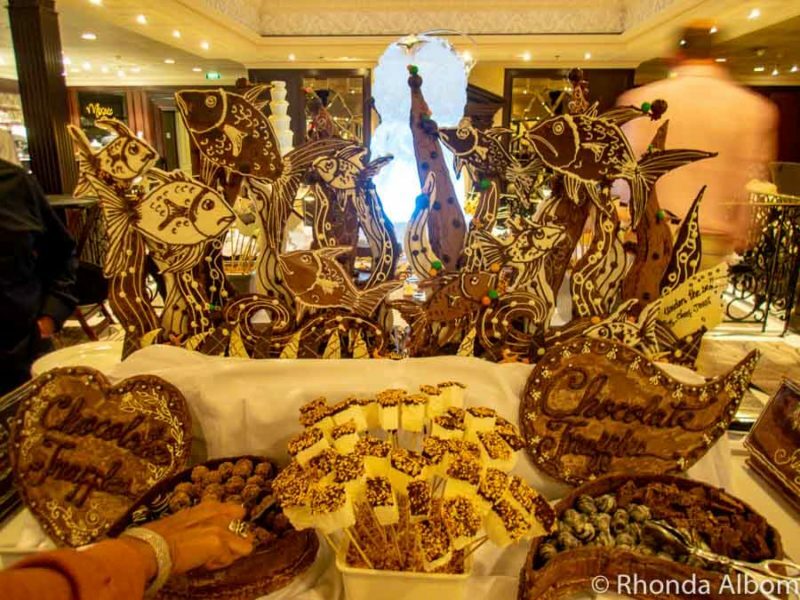 Subtle festive signs were interweaved throughout the Azamara cruise ship, although there were no religious overtones. Azamara Pursuit anchored off Punta del Este, Uruguay. Looking down on the pool deck. 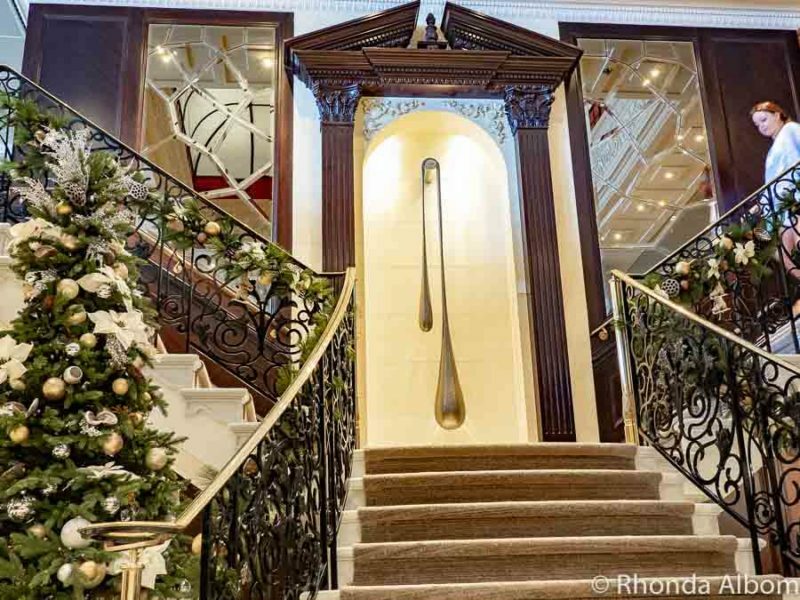 The elegant staircase across from guest relations is decorated for the holiday season. Azamara’s strength goes beyond her ability to visit ports that are too small for many larger ships. Their excursion program focusses on individuality and cultural immersion. It starts on-board with destination expert lectures that concentrate on daily life as much as on key sites. Add to that longer shore time in each port, local guides, and shore excursion groups not to exceed 25 passengers, and the result is an intimate cultural experience in a fascinating community. However, passengers do pay quite a bit for this advantage. 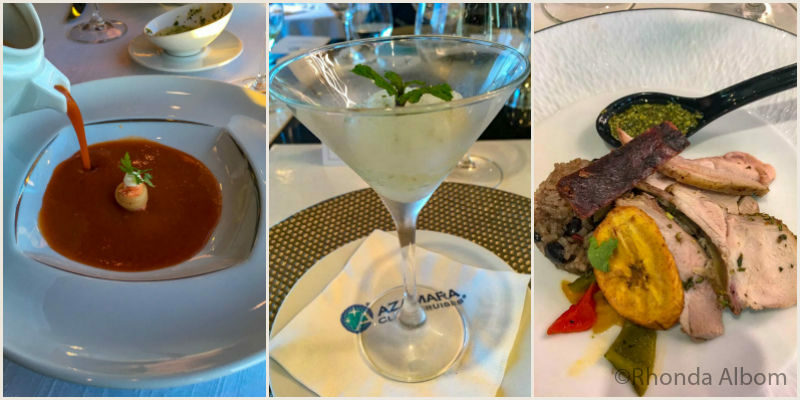 We opted to do a mix of independent and Azamara excursions, taking full advantage of the longer port times, especially some of the evening and night options. After all, we picked the Azamara Pursuit for the ports. A nearly perfect name for this shore excursion, the AzAmazing evening distinguishes the Azamara group from its competitors. This complimentary evening of culture and fun went way beyond our expectations. 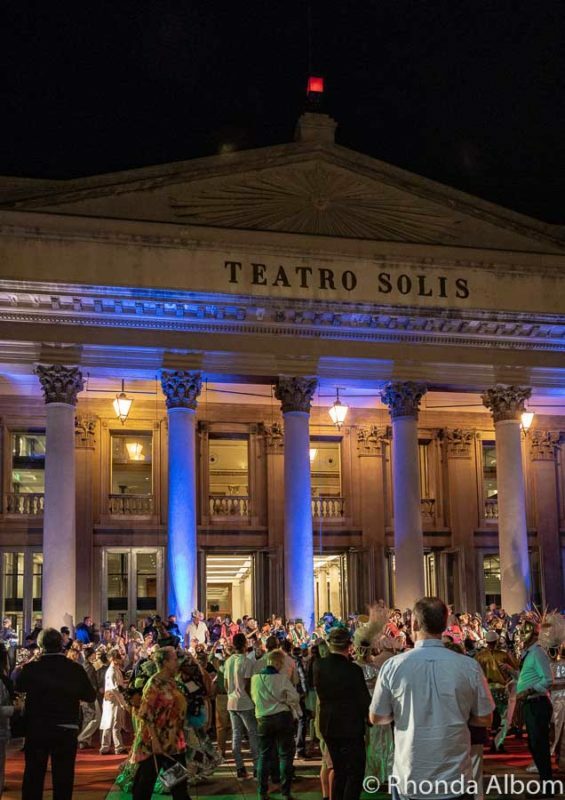 We were taken to a magnificent historic theatre in Montevideo Uruguay where we were enchanted by a lively carnival-style show from Museo de Carnaval. 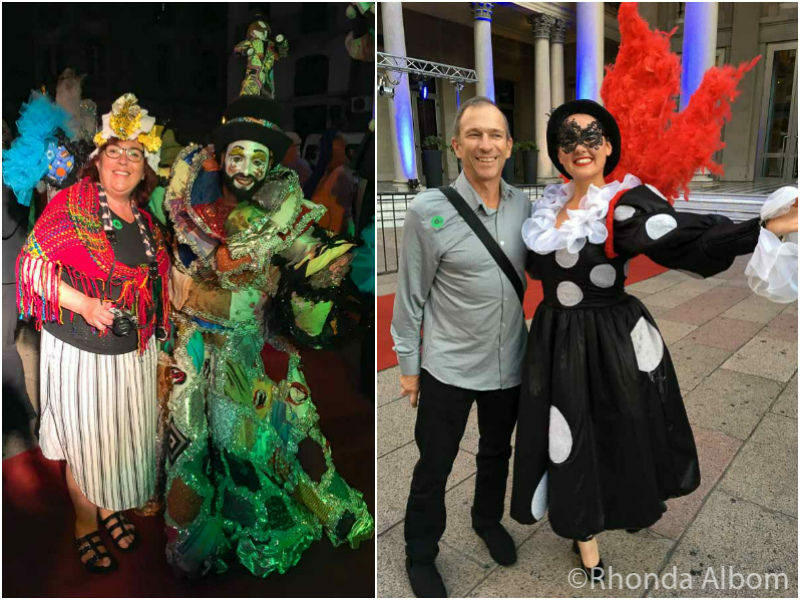 After the stage performance, we followed rhythmic drummers outdoors, where our evening continued under the stars while we donned masks (provided) and enjoyed drinks and fireworks. 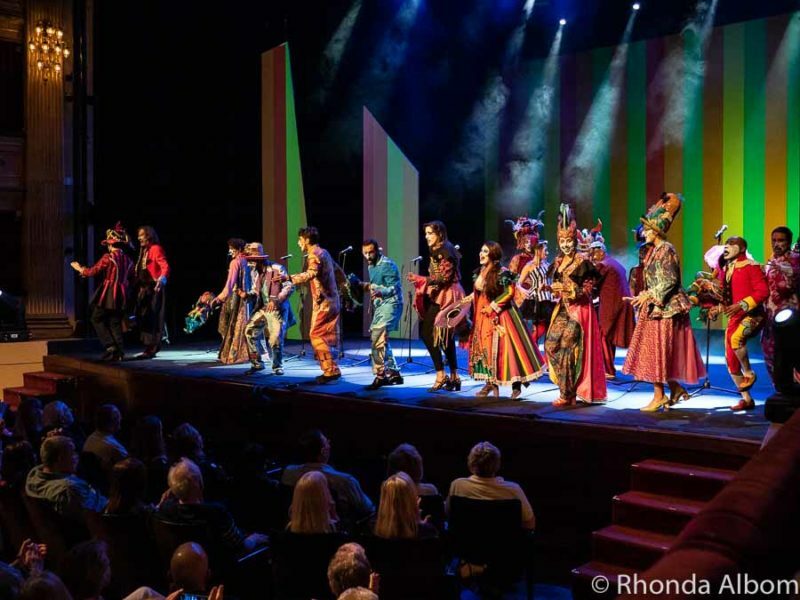 Colourful dancers on stage during the Azamazing event at Teatro Solis, Montevideo Uruguay. Outdoors just after the stage performance portion of the evening. The vibrant entertainers took time to pose with us. A late night, it was perfect for my new shawl (purchased in Buenos Aires) and Jeff’s new easy to wear, super comfortable, and quick dry travel shirt from John Miles of Australia. The addition of the Pursuit to the Azamara fleet allowed expansion to more destinations. 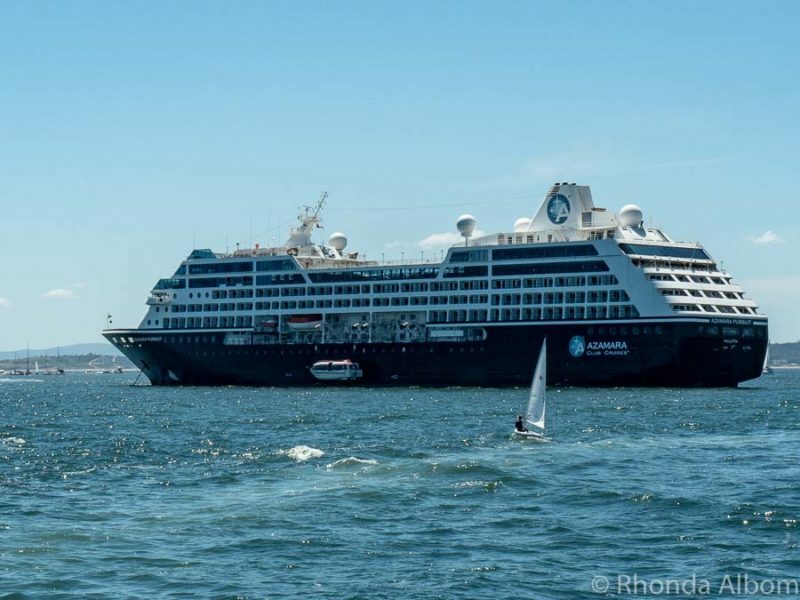 While South America was relatively new on the Azamara itinerary, the staff seemed knowledgeable. If you are a frequent cruiser on other lines, be sure to notice how long we were at each port. We were captivated by the European charm of Uruguay’s capital city, the destination of the AzAmazing event for this cruise. Port time: Two days, with an overnight stay. Discover a variety of things to do in Montevideo. Here, we sampled some of the world’s best coffee and wondered about the stability of the leaning buildings along the coastline. Check out the coffee museum and leaning buildings for yourself. We fell in love with this Portuguese colonial village during a walking tour of the historic old town. Learn more about this charming self-cleaning pedestrian only coastal village. An open-air trolley took us to over 20 beaches before we walked the streets of this former fishing village. Standing at the base of Christ the Redeemer, we enjoyed the panorama of the city. The impressive sweeping view was only one of several high points in Rio de Janeiro. Port time: 2 days and 2 nights including New Year’s Eve fireworks over Copacabana Beach. Discover Rio, one of the most intense cities I have visited. Fireworks over Copacabana Beach on New Year’s Eve in Rio de Janeiro Brazil. The captain added this port to the itinerary due to poor weather ahead at Punta del Este. It’s a walkable town with delicious seafood and a nice beach. Its white sand beaches make this town hugely popular amongst Argentinean holidaymakers. We enjoyed a walking tour. Scheduled for 1.5 days with an overnight, we lost a day due to bad weather. In the end, we had 9 hours in port. Returning to one of my favourite cities was a thrill. Port Time: 2 days, with an overnight stay and disembarkation. Recoleta Cemetery in Buenos, Aires, Argentina. Like all cruises we have been on, food is a central feature. However, the Azamara’s all-inclusive style means wine flows freely at dinner, specialty coffee is always available (at no extra cost), and we could even have frozen drinks out at the pool or spirits in the evening. The impeccable food presentation was matched by a combination of flavours reflecting the theme of the evening’s Azamara menu. Surf and Turf (steak and lobster) in the main dining room, a beautifully presented appetizer (also main dining room), and desserts from the buffet. Other dining options include a grill, afternoon tea, specialty restaurants, and a coffee shop where you could find me every sea day afternoon. 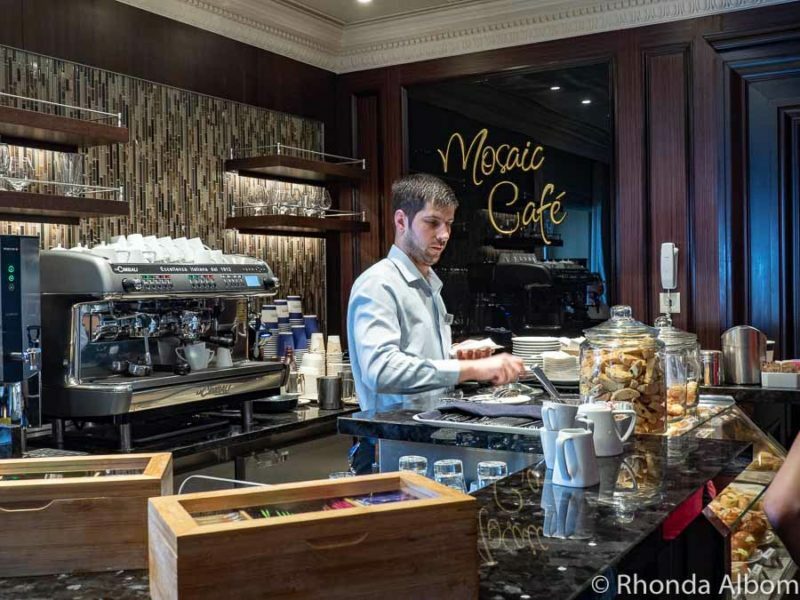 Lattes, espressos, and other specialty coffee drinks are included in the cost of an Azamara Cruise. The Chef’s Table dinner (extra charge) was an impressive masterpiece. 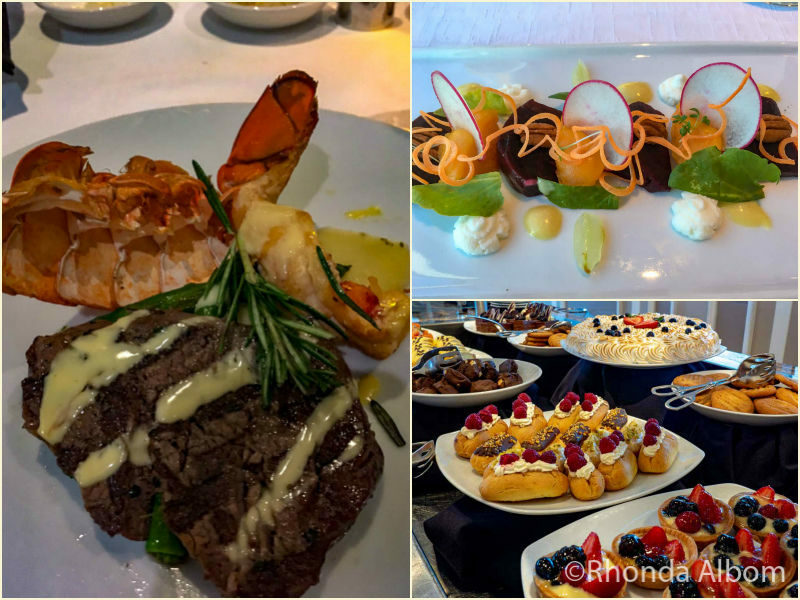 Like the Chef’s Table we enjoyed on a prior Royal Carribean cruise, it was by far the best meal on the ship. We also enjoyed a meal at each of the speciality restaurants onboard. The flavours are even better than the presentation. Cruise clothing, like street styles, range from overstated to underdressed. Azamara encourages a “friendly yet sophisticated onboard environment.” Therefore, the general daily dress is “resort casual”. The only “rule” I saw was no bare feet, tank tops, baseball caps, bathing suits, shorts, or jeans allowed in the dining room or specialty restaurants. However, there is no formal night on an Azamara Club Cruise. We are overlooking the White Night event as the guests begin to arrive. The pool was a perfect way to cool off on a hot South American summer day or evening. 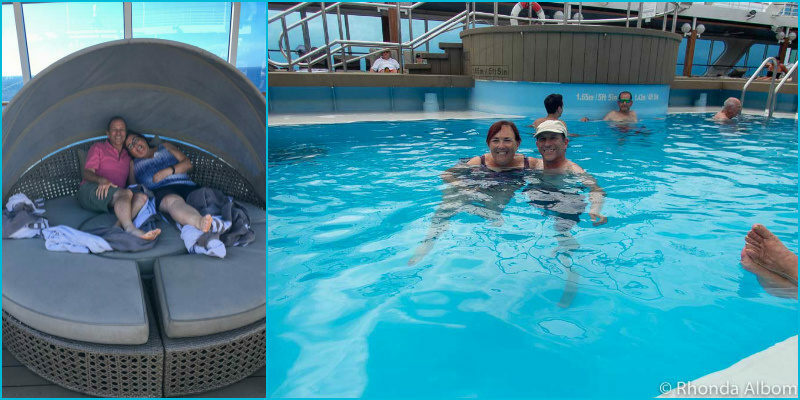 In addition to traditional lounge chairs, there were random, relaxing options not usually seen at shipboard pools. Have you ever seen anything this cool on a cruise ship before? In the first shot, we are facing the pool. There are also plenty of quiet spaces onboard. The Living Room and Drawing Room are my two favourites. These and other spaces on the ship are also used for daily trivia games, art and dance lessons, enrichment lectures, exercise classes, social meetups, and weekly religious services. And, late at night, the Living Room converts to a disco. 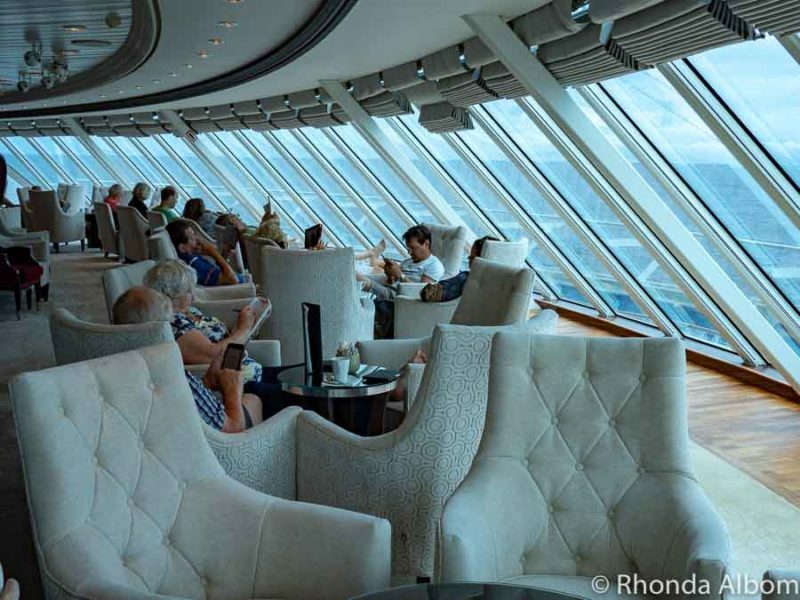 Floor to ceiling windows at the front of the ship bring in light, but it is the espresso bar and afternoon tea sandwiches that lured me into the Living Room. The Drawing Room offers fewer distractions and is a great place to find a book to read. On this particular occasion, a very talented guest played the piano. 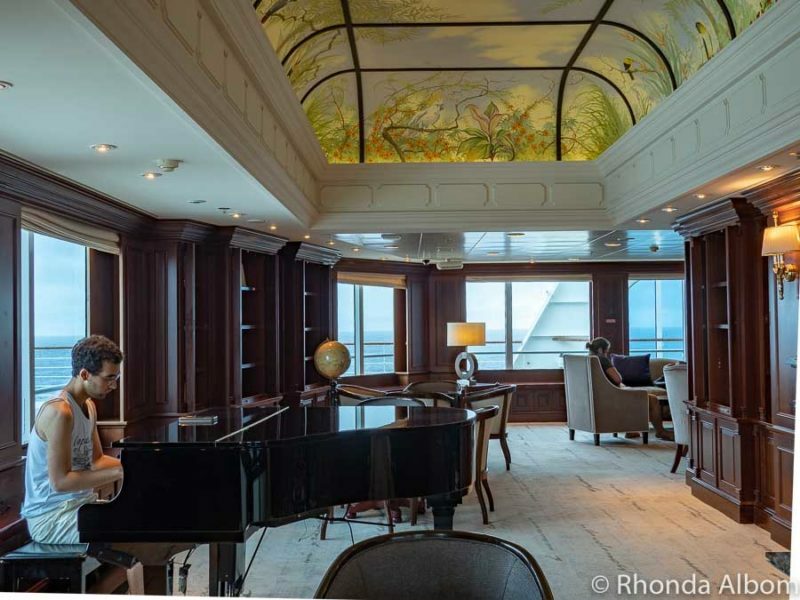 We spotted three pianos onboard. The cabins are tastefully decorated in a modern minimalist fashion. 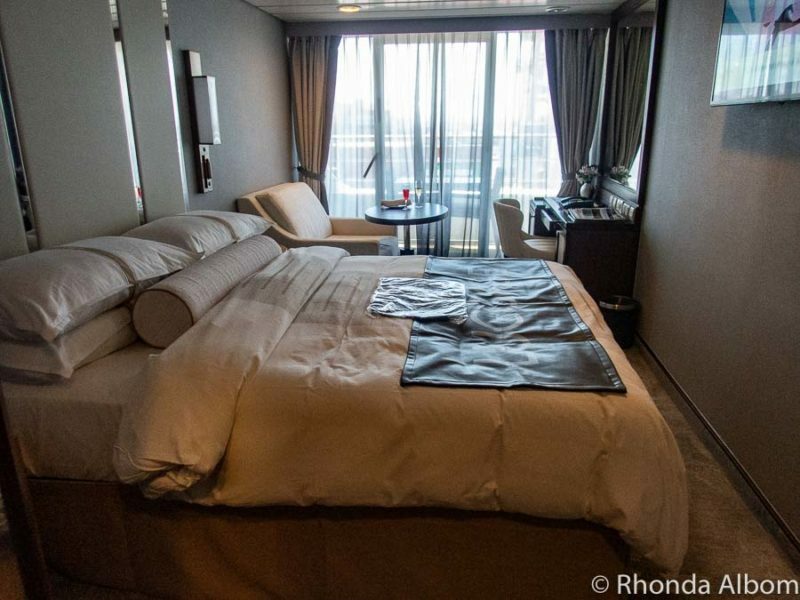 While I think our Club Verandah stateroom might be smaller than other ships, it did an excellent job utilizing the space, providing plenty of storage, a decent size shower, a usable desk area, and an easy to access and relatively private deck with a table and two chairs. Once we turned the couch to face the sea, we felt like we had more space. Our Club Verandah stateroom on the Azamara Pursuit. The smaller ship meant we never had to walk far for anything. 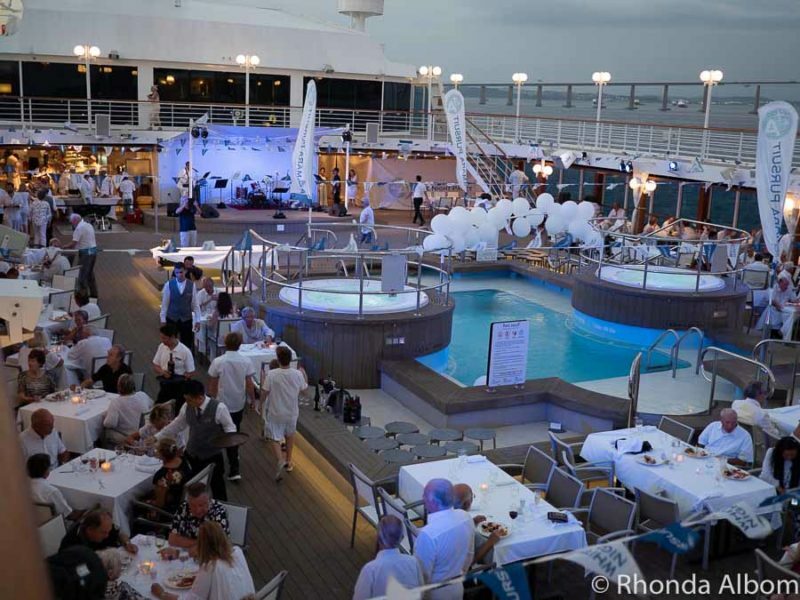 Like other boutique cruise ships, it offered unique opportunities, yet many of the general tips for cruising still applied. Nightly entertainment in the cabaret lounge rotated from dedicated Azamara performers to guest entertainers including a hilarious comedian, beautiful dancers, and a Las Vegas singer. Our cruise package included Azamara wifi for two devices. Pro Tip: It works for two devices at a time. So as long as you log out of one, you can log into another using the same password. The downside is that the internet is a bit slower than what we have seen on some of the other ships. The gym is a quick reminder that this a modern cruise ship, featuring the newest of everything. Massage, facials, hair, and nails are amongst the standard services offered by the Azamara Spa. Pro Tip: We found the spa prices to be very high, even for a cruise ship. However, there were near daily specials. Rather than scheduling in advance, twice I read a daily flyer, rang up, and had a fabulously relaxing treatment for nearly half price. And if all this isn’t enough, there is a chocolate night. One small section of the chocolate buffet. We often get the best prices when we can travel last minute, as cruise companies don’t like to sail with empty cabins. This year at the Melbourne Retail Festival we had many exhibitors who are leading the way in fashion with their creative innovations. We would love to share with you five of the most inventive product developments from Australian designers that were showcased at the fair. Meet Jane: the clever designer of the John Miles crease-proof, sweat-proof and daggy-proof shirts. Jane’s husband regularly travels on flights for work, which presented a problem – his shirts would always come out creased! And so, her search begun to find the perfect shirt and that would withstand the annoyances of travel. When she could not find the one, she set out to design her own. The result is a stylish non-iron, moisture wicking and classic fit dress shirt. Currently there are four classic colours available – white, pale blue, blue/white gingham and black/white gingham – with plans to add more to the range soon! Sandals have a reputation for not always being the best for your feet, but the podiatrist-approved Aneara shoes are changing the game. Andrea Selman, CEO and head Designer of Aneara, was looking for fashionable age-appropriate shoes with support for her daughters’ growing feet. After visiting the girls’ podiatrist to buy shoes for summer, the Podiatrist said “That’s it! We have nothing more after this size for them”. Andrea couldn’t believe at the age of 9 – the girls could now wear ladies orthotic shoes. Surely this wasn’t correct. But after much investigation this was the case. In early 2016, Aneara was born. With a couple of shoemaking courses under Andrea’s belt and sketches under her arm, she was on a mission to create age appropriate and supportive shoes that are great for growing feet. What makes an Aneara sandal unique is the footbed that gives support, with a deep heel cup, structured heel counter and adjustable ankle straps – no more aching legs and backs! Andrea continues to make her own prototypes in her own shoe studio, working extensively with podiatrists, physiotherapists and shoe manufacturers, to create shoes good for your feet. We can’t wait to see what’s next! Australia’s premium hosiery brand, Chusette have created a unique fabric that truly stands the test of time. A carefully curated combination of cotton, bamboo and cashmere, Chusette socks are designed to keep you comfortable all year round. The socks have a comfortable elastic top, invisible seams and reinforced toe and heel. We love not only that the Chusette socks are not only a great innovation with their unique blend, but that they are also a truly family brand with sizes catering to all ages. Rebecca Formoso’s colourful intricate jewellery designs are truly one of a kind. Handcrafted from her studio in Seaford, Rebecca finds her inspiration in nature to achieve a feminine and bold statement. Her designs are made with a combination her favourite gems, crystals, pearls, feathers and findings – all in colours that she can’t resist. We totally agree with her philosophy that life is too short to wear boring jewellery! One day a retailer asked Rebecca if the feather on one of her necklace could be clipped on and off so that the customer can choose depending on the occasion. This inspired Rebecca to create more jewellery with customisable elements so that customers can enjoy more versatility with her designs. Rebecca has also worked with her retailers to create pieces that compliment new season clothing perfectly. Printemps Ete is a wonderful example of how designers and retailers can collaborate together to create innovative pieces that their customers will love! Cali Rae has created the world’s first scent infused swimwear range! This was inspired by their love of all whole foods. Organic, vegan and delicious, Cali Rae take careful consideration into choosing the highest quality fabrics in the most desirable scents. The scent range includes apple spice, blackberry, chocolate, lychee, pina colada, pineapple, pomegranate and strawberry. The swimwear is infused using a fabric spray that has been made with premium fragrance oils and essential oils. The spray is alcohol free and does not contain any harsh chemicals – completely vegan and cruelty free! As much as we love them, Dad’s tend to be notoriously difficult to buy for. Ask them for gift ideas and they will invariably say, “Just a bit of peace and quiet”, or “There’s nothing I need, don’t waste your money”. Then he’ll duck back behind his newspaper or disappear into the shed. Infuriating, really. From their creative “crafting” attempts in toddlerhood to amusing DIY cards or more impressive artworks when they’re older, anything made by his offspring will have him swelling with pride. They might evoke a forced, hollow laugh upon unwrapping, but they will swiftly disappear to the back of a drawer until unearthed by baffled archaeologists centuries from now. What kind of father wouldn’t like a swishly packaged, lovingly selected tipple on his special day? A case of fine wine, a bottle of single malt whisky or artisanal gin, even a mini-cask of his favourite ale… Cheers, Dad. Hic. Unless he’s a dedicated tech fiend, gadgetry can leave your average father befuddled and feeling a little lost. Instead, opt for nostalgia with a vinyl turntable, vintage books or a retro-styled DAB radio. Boys’ toys like Scalextric or Air Hockey will have him reminiscing back to the good old days, just as long as you let him win. More of a Mothering Sunday tradition, but an extra hour or three in bed can be a rare delight for dads, too. So switch off his alarm, then have a slap-up breakfast and his favourite newspaper waiting when he does emerge. Don’t do breakfast-in-bed – it gets crumbs everywhere. Instead, ensure bacon and egg stacked with hollandaise is wafting delicious aromas through the house, driving any nearby vegetarians/ dogs insane. Vouchers for some sort of “pampering” it might seem like the logical extension of a grooming gift, but beware. He’ll be deeply self-conscious. He’ll feel exposed in his towelling robe, like a spy about to be assassinated. He’ll secretly resent it. Especially if he has to wear those weird slippers or (even worse) paper pants. Don’t try to metrosexualize him if he’s resistant, but grooming treats are usually appreciated and precisely the kind of thing he’ll rarely buy for himself. It’s hard to go wrong with fragrances, skin care or hair products. He’ll be at his handsome best in no time. If he’s dropped unsubtle hints about wanting something boringly practical – say, a power drill, garden shears or plain leather wallet – swallow your pride and buy it. Many a disappointed dad face has resulted from people mistakenly believing something is “too obvious” and trying to surprise him instead. Not the jewellery type (that would be weird). The phone call type, if you can’t see him in person. He’ll probably harrumph about “making a fuss” and say “I’ll get your mum” within two minutes, but he’ll love it really. Avoid self-help book that sends a passive-aggressive message of his parental shortcomings. Men tend to be obsessive hobbyists, so indulge his latest fixation – whether it’s angling or archery, meat-smoking or golf. For runners, how about wireless earbuds or a foam roller? If he is golf mad try a new driver or putter, spends his weekends in the shed a hardware voucher. Your mother might roll her eyes, but his will light up. As tempting as it is it is best to avoid gimmicky gifts, you may get a little giggle out of him but inevitably they will end up at the back of his draw along with his novelty socks or pride of place at your next garage sale. You can keep your Michelin stars and tiny portions. A hearty Sunday roast, washed down with a pint or two (let Mum drive), will ensure paternal contentment – especially if he doesn’t have to pick up the bill for once. Make a reservation, though. If there’s one thing dads find disappointing, it’s poor organisation. And queues. And hunger. OK, three things. You might think it’s modern, but he’ll snort with contempt – and not just for hayfeverish reasons. Plus he will also suspect they’re really for Mum. Whether he fancies himself as a home chef or just enjoys eating, the way to his heart is through his stomach. Meat hampers, chilli sauces, coffee subscriptions, jars of posh pickles or pork scratchings… anything that makes him lick his lips, rather than sheepishly mumble, “That’s lovely, darling”. I am guessing he is not Jeremy Clarkson or Ryan Gosling on the streets of California in the movie Drive. Although if he actually is, perforated leather ones are best! Frame something for him to stick on his study wall and gaze at adoringly. A montage of family photos, his favourite book cover or album sleeve, an old sports kit or military uniform, a cartoon or map that he likes. It might be too late for this year but bear it in mind for next time. The summer is almost here, and it’s time to talk about something that could possibly change the way you think about dress shirts. For many men, wearing button-up shirts can be uncomfortable because the shirts often absorb sweat in the heat. In this post, I want to introduce John Miles – the ultimate shirt brand that sells performance dress shirts that are moisture-wicking, wrinkle-free and quick-drying. Their shirts would make great gifts for men this summer as they’re some of the most functional shirts that I’ve seen! A bit about John Miles- the brand makes all their dress shirts in Australia, which means that the materials and manufacturing process is extremely high quality. The shirts are made with a 4-way stretch which means that their garnets give off a slimmer look. The most unique thing about their shirts is that they are totally wrinkle-free and hassel-free, which means that you can scrunch it in your bag and it will still look fresh after you take it out! I recently got this lovely Non-Iron Classic Fit Pale Blue Dress Shirt – I chose this shirt because of it’s beautiful colour, as pale blue is an elegant, versatile and flexible colour that goes well with any outfit, be it casual or formal. The most important thing about a good shirt is that it can be worn in any occasion, and this one definitely fits the bill. John Miles also sells them in white, gingham and other cool colors. In terms of the style, the shirt is beautifully designed and looks extremely stylish. I think the lovely blue pattern is beautiful because it is slightly textured, which makes it look unique and interesting. The knitted pattern of the shirt makes it stand out from regular plain shirts. The shirt also has removable collar stays, which makes the collar stand up well and suited for formal occasions. I love the shaped hem in the bottom, and the lovely white buttons which blends in with the shirt. As for the comfort and fit, the shirt is made with a very stretchy material composed of Nylon, Lycra and Polyester. The combination of these materials means that the shirts are quick-drying and any sweat from the body is quickly evaporated in the air. I got a Size Small for my boyfriend, and it fits him just fine. You can probably get a size smaller because of the fit, but they have a useful size guide which you can use. The shirt is extremely soft and comfortable, which is really surprising as I never expected a synthetic material to feel so luxurious! The quality of this John Miles shirt is absolutely top-notch. Since John Miles makes their shirts in Australia, their quality check is impeccable, and they even package their shirts in laundry bags that you can use to wash your shirt in! I really enjoyed this little touch, and washing the shirt in a bag will also extend the shirt’s life, ensuring that it lasts for years to come. Overall, John Miles really hits the sweet spot in creating functional, beautiful and hassel-free shirts for men. It’s hard to find shirts that can keep one cool during the heat, and these shirts pack and unpack easily without any wrinkles at all. They outperform any dress shirt that I’ve ever seen, and is my boyfriend’s new favourite shirt (which got him lots of compliments). I cannot recommend John Miles enough! Who else doesn’t give a stuff about their shirt? It’s just something us guys need to do. But it doesn’t mean we like it. We’d much rather walk around in a singlet, tracky dacks and runners all day. Not constantly adjusting collar and worrying about our sweaty pits in a tight, hot, uncomfortable shirt. Does a shirt really matter? A well dressed man is the best accessory a woman can have. Dressing well being a form of good manners, according to Tom Ford. Someone give me a no fuss shirt please!!! Scrub burger juice stains off it like our life depends on it. Like playing golf with the boys. Taking the kids to cricket. Learning what makes a good brew. Figuring out how to keep our better halves happy (happy wife happy life apparently, though we know that’s not quite true). In short: Life is too short to waste it thinking about shirts. But I still need to look good, society tells me. So go on, just give me a low fuss shirt that never goes out of style and get on with it. I’m out for drinks with the boys tonight. The unique Australian climates presents a challenge in finding adaptable shirts that perform consistently, no matter the weather. The John Miles Ultimate Dress Shirt: is comfortable in all weather conditions, hot, cold, dry, humid, It fits well, does not show up unsightly sweat marks and never requires ironing. We wanted to make a shirt that is as easy to look after as it is to wear: Wear, throw it in the wash, hang to dry, repeat. It’s that simple! Our shirts tick all the boxes; Great Fit, Classic Styling, Luxury Fabric, Non-Iron, Moisture Wicking, Easy Care and most importantly: Comfortable. Our shirts will stretch with you, breathe with you and will hopefully turn out to be your new favourite go to shirt for work and play.